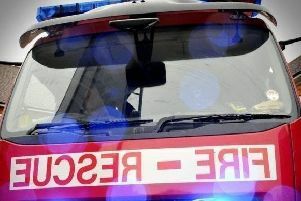 Firefighters at Ashfield Fire Station have warned residents about the dangers of inconsiderate parking after a fire engine got stuck on a residential street. Officers released images of a number of incidents where fire engines had been trapped by poorly parked, or double-parked cars on a street. An example of an obstructed fire engine. Firefighters warned that, if their vehicle cannot get down streets, it may put people at risk who are in danger of a fire, when they are on their way to an emergency. A spokesman said: "Imagine that the station receives a fire call - a house fire with persons reported inside, and on the way to the property are met by parking as shown in the pictures. "Always think, would a fire appliance get through? "Bad parking is putting lives at risk, and often impacts on our response times. “It is imperative that when drivers park their cars they leave enough room for a fire engine to pass – just remember, we could be trying to get to your home or to rescue you or your family another time. "Can you please consider this the next time you park your vehicle." Firefighters show what they are up against.